I shared the image above on LinkedIn and it received 1,402 views—the most reach of anything I’ve ever shared on LinkedIn. So, it’s not just me, right? This is a big idea. And, I know it’s not exactly new. But, something about seeing it on the page like that commanded my attention so much that I can’t stop turning it over in my mind. 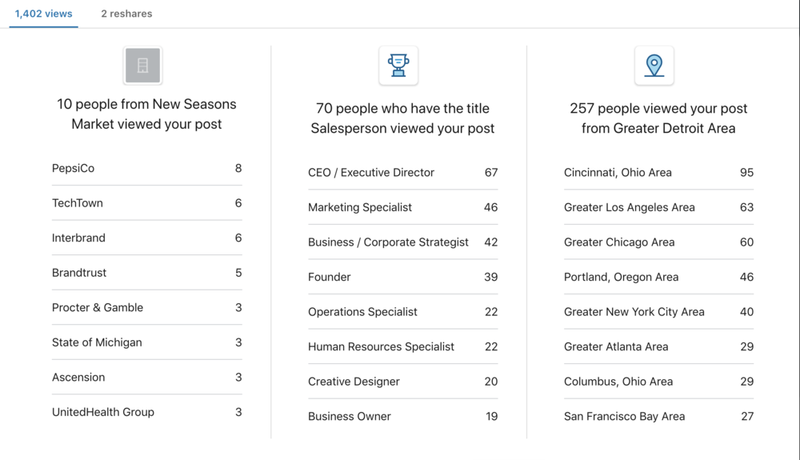 A screen capture that reflects the analytics on this particular LinkedIn post. I keep thinking about HOW to embrace that idea as central to my work. For my client projects it makes sense. I know what to advise them. I have been struggling to figure out how to internalize this idea to my consulting practice. what’s the corporate culture at walmart vs amazon? how about the community culture in Lackawanna compared to Dumbo? so we should build our culture with intention, right? Through the lens of culture as strategy, the Amazon example in the article is particularly compelling. Their signature element is 1-Click shopping, which is operational in nature. But, they’ve committed to such an extent that this operational practice has become their strategy. As a result, their signature element has evolved into owning the idea of "no patience required." Especially for those service providers among you, what is your signature element? If you don’t have one, what could you do operationally to signal your strategy? What do you do to understand your clients’ and your own cultural context?